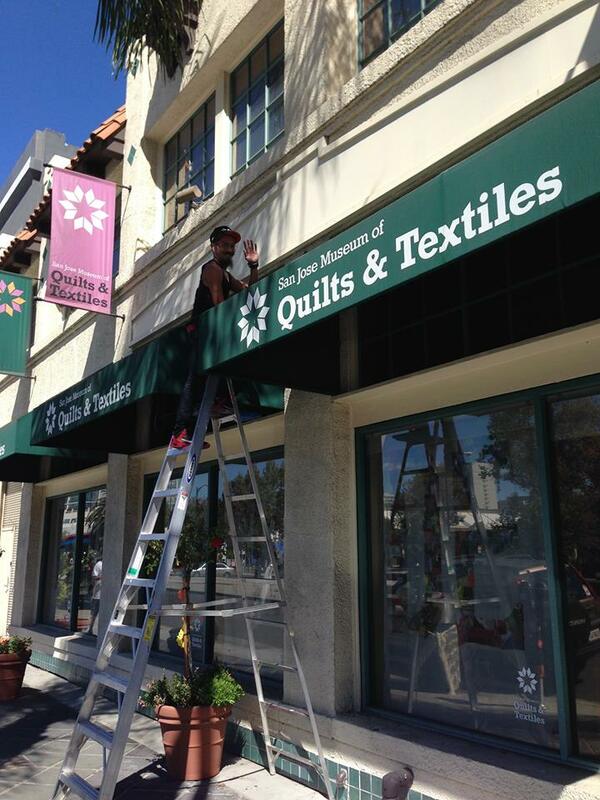 Last weekend was full of yarn tagging fun as the San Jose Museum of Quilts and Textiles celebrated Museum Day Live! We started on Friday, sorting through all the donated materials to see what we could use. Many volunteers helped with this process! 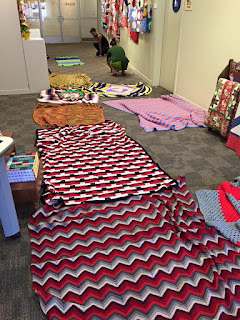 Donated afghans and other yarn creations. So much handmade goodness! In the background, serious plans being made by Jerome of Gridjunky and yours truly, Jen of Mama's Magic Studio. 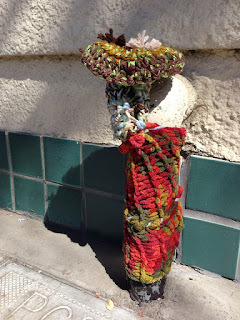 The vision was to "yarn bomb" the awnings outside the museum, as well as to yarn tag as much as possible on the street and in the green area across from the museum. It took a lot of planning, piecing, measuring, and stitching to get everything lined up. Then, once the awning tops were put together, they needed to be hung up. Jerome from Gridjunky was the engineer planning it out, and then up on the ladder getting it done. Jerome of Gridjunky pauses and waves for the paparazzi. The result was amazing! Custom-designed yarn bomb toppers for each of the five awnings. It really needs to be seen in person to appreciate the effect. Yarn bomb awning toppers at the museum, each custom designed and created to fit. All up and down the street, we got going with the yarn tags. 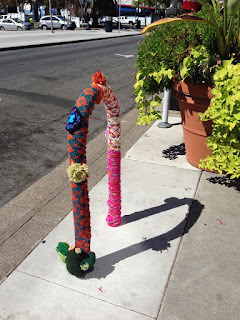 From pom-poms to more elaborate installations, no surface was safe from the yarn taggers. Tagging with yarn pom poms! I helped out a little bit on Friday, and my daughter joined me on Saturday for more yarn tagging fun. Together we created this whimsical tag on top of a bike parking tube, using donated machine knitted materials, some granny squares, and a plush crocheted cactus. 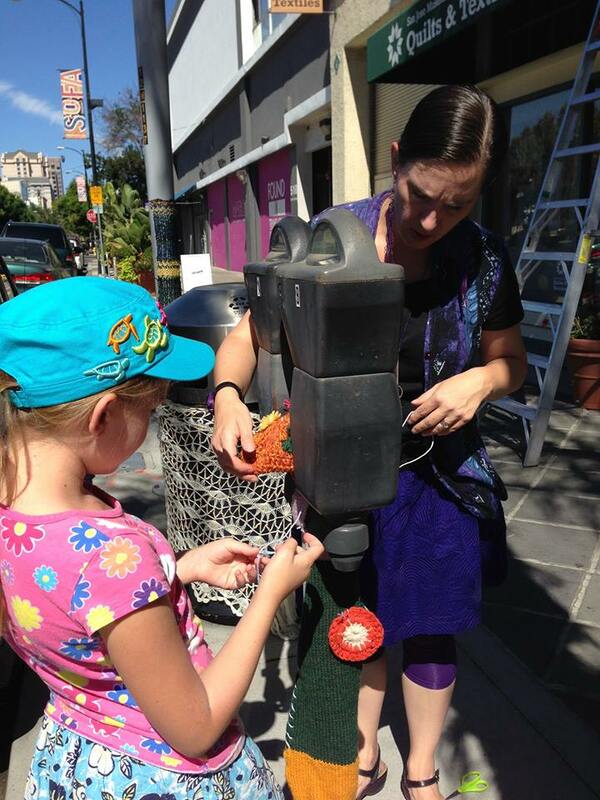 We also placed a bunch of pom poms and tagged a parking meter with a scarf, flowers, and a mushroom. Mother-daughter team, tagging a parking meter. The museum staff was a big part of the action, of course. 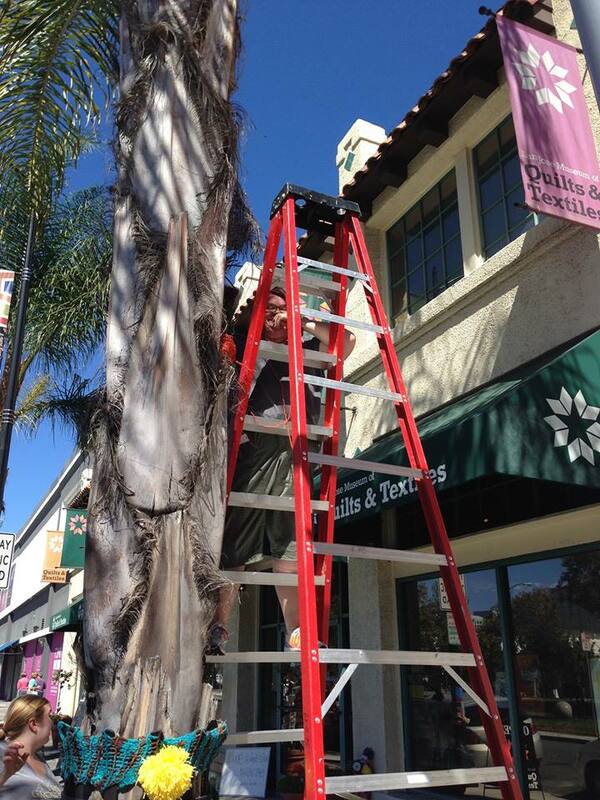 Joan, the executive director, took her turn up on the ladder to tag a big palm tree out front of the museum, assisted by Elizabeth, the Manager of Museum Education. Museum staff, Joan and Elizabeth, hard at work. It was so neat to think of how many hours of work had gone into the handmade yarn creations that people had donated. 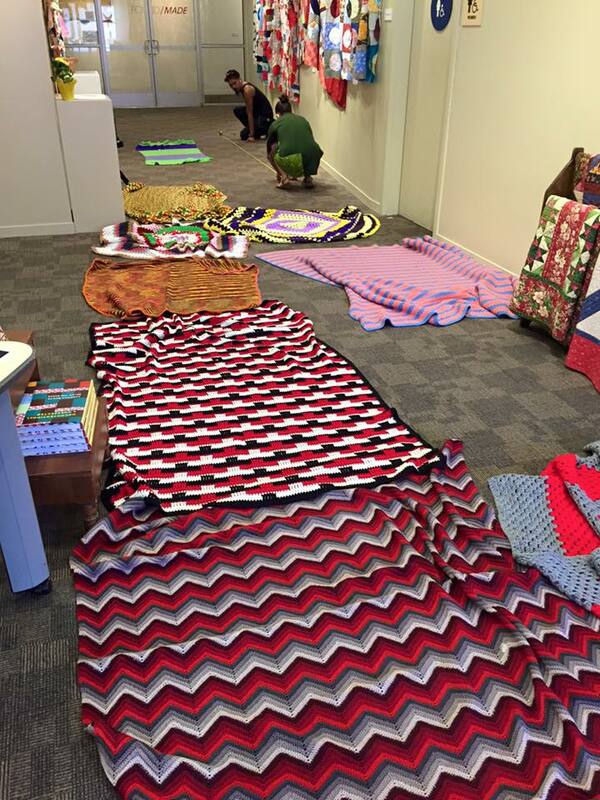 All those stacks and stacks of afghans, scarves, blankets, and more! I personally was delighted to find a new home for an old handmade item -- some time back, I hand crocheted a cover for an inflatable yoga ball. The ball popped, and I'd hung on to the cover because I just couldn't bring myself to throw it away. 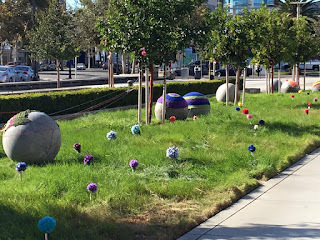 When I was there on Friday, I noticed the stone spheres in the garden across the street, and a lightbulb moment happened. 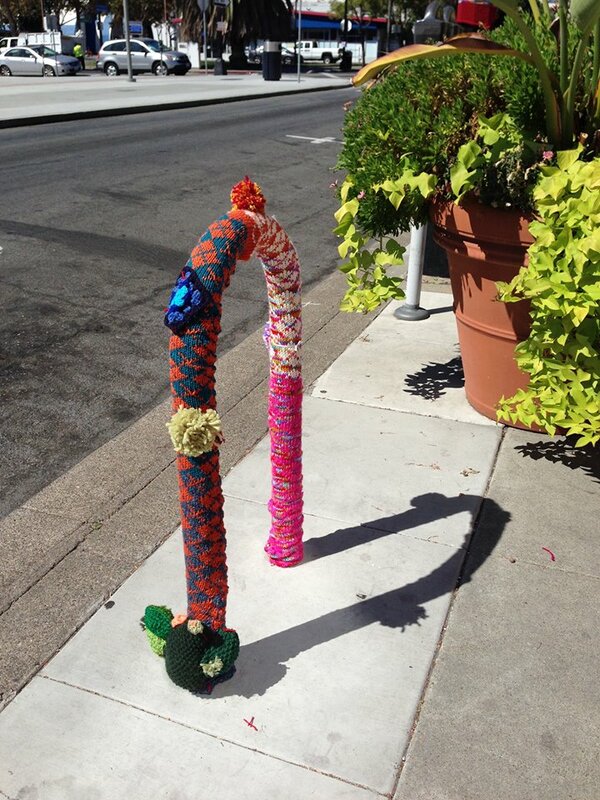 Turn it into yarn art? That was a re-purposing I could absolutely agree to! 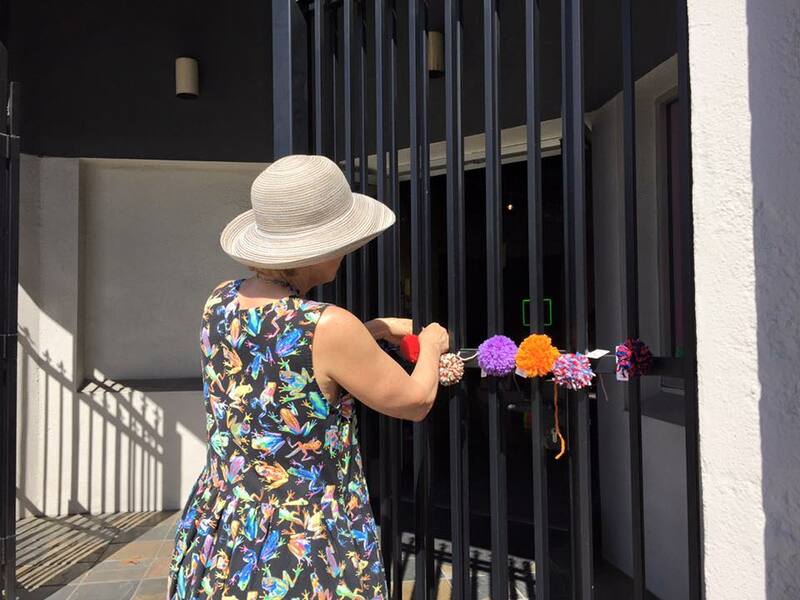 Handmade magic from Mama's Magic Studio becomes part of the yarn tagging fun! 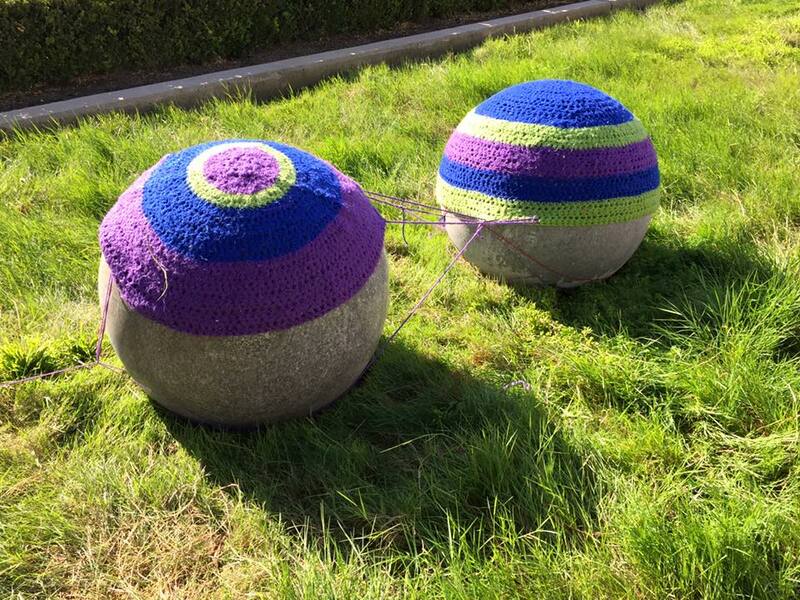 These used to be a cover for a yoga ball! By the time we were done, the entire green area had been bombed. 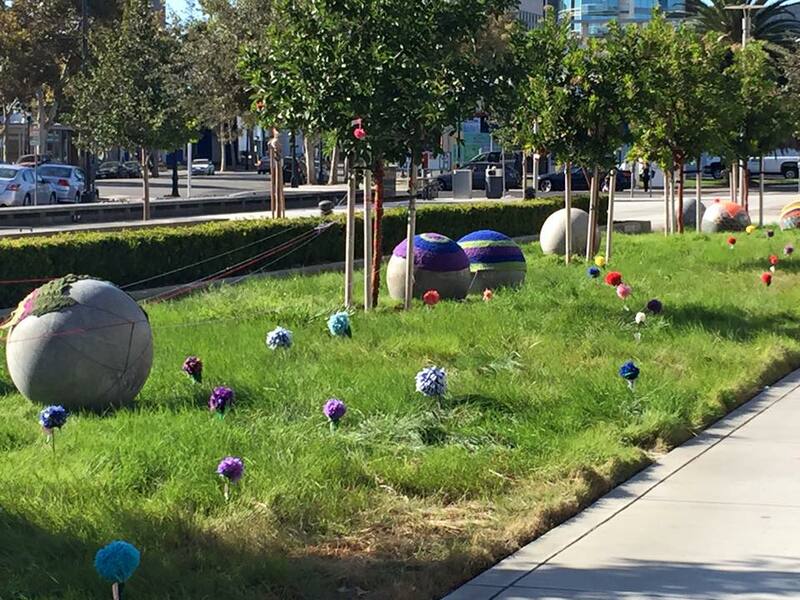 Yarn bombed garden by the museum. This project couldn't have happened without the creativity and help of another SF Etsy friend, Amy of Jumbo Jibbles! 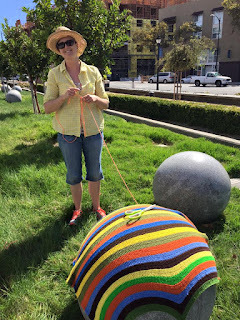 Her expertise and savvy ways with a strand of yarn were invaluable parts of this project. Amy of Jumbo Jibbles working hard on a yarn tag in the garden by the museum. Amy and I serve together on the museum's new Advisory Committee, a group helping the museum with some new ideas and approaches. Amy coined the hashtag #wtfiber for this and other textile goodness at the museum, and we even had little #wtfiber label to include with our yarn tagging. I had fun creating a little tag for a pipe outside the museum. 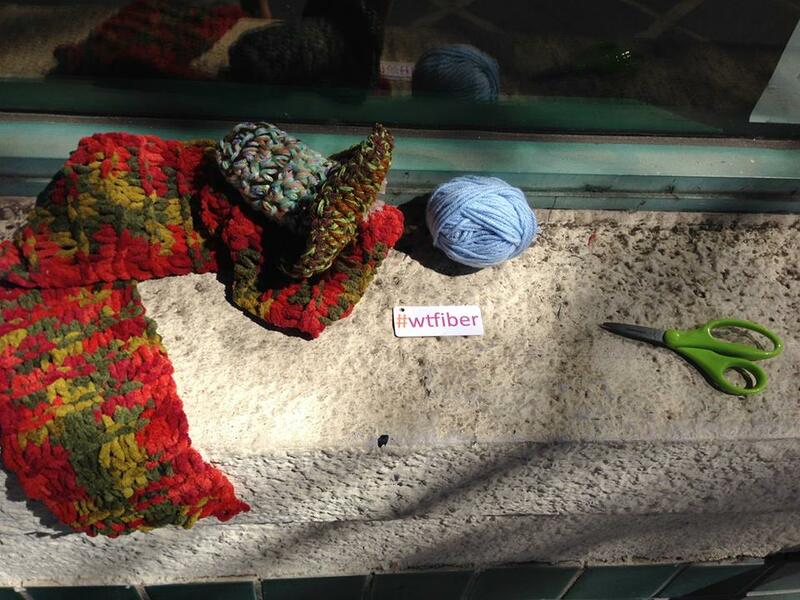 Ingredients for a yarn tag, including #wtfiber tag. Finished tag. I call it "Pipe with Mushroom." Yarn tagging will be happening at the museum as long as they have yarn materials to tag with, so if you'd like to join the fun, be sure to stop by soon! 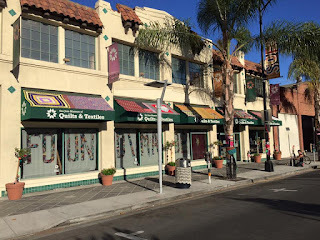 The San Jose Museum of Quilts and Textiles is a true gem of a museum in the SoFA district of San Jose. Be sure to check out the fantastic exhibits while you're there! Many thanks to the folks at the museum for permission to share photos of this event.